Heat the oven to 350°F / 180°C. Butter and flour a 10-inch tube pan or 12-cup bundt pan. To make the cake ~ Sift the flour, sugar, baking powder, and soda into the large bowl of a stand mixer fitted with the paddle attachment. Add the butter and mix on low speed until fine crumbs form. With the machine running on medium speed, whisk in the oil, orange / lemon zest, vanilla extract, and orange juice. Whisk in the eggs one at a time and then increase the speed to high and whisk the batter until light, about 3 minutes, scraping the sides of the bowl if necessary. 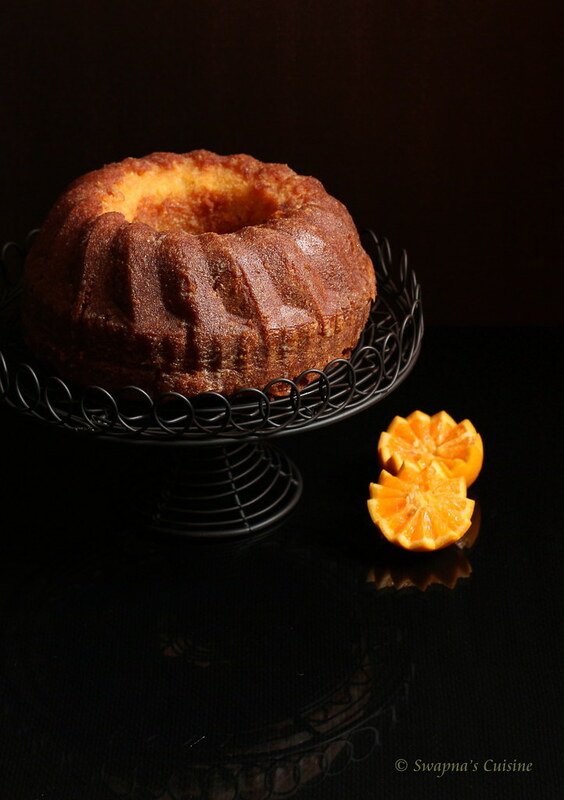 Pour the batter into the prepared pan and bake until a toothpick inserted in the cake comes out clean, 45 to 50 minutes. 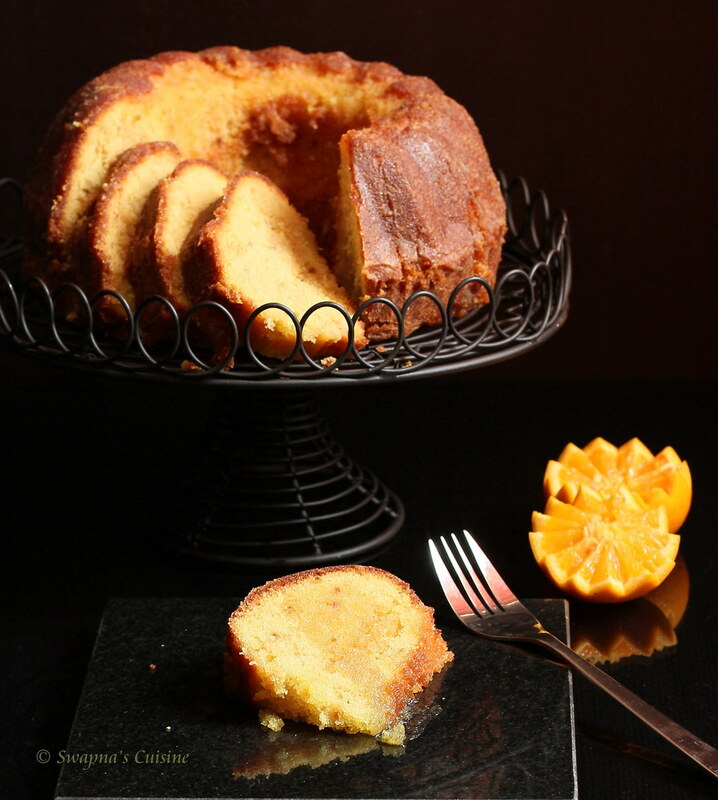 To make the syrup and glaze~ While the cake bakes, whisk together in a small bowl the orange juice concentrate, butter, rum, and ½ cup of the confectioners' sugar. When the cake is done, set the pan on a rack to cool for 5 minutes. With a thin skewer, poke the cake all the way through to the bottom of the pan in about 100 places. Pour ⅓ cup of the syrup over the cake and let stand for 1 hour before removing the cake from the pan. (At this point you can wrap the cake in plastic and hold for up to 3 days at room temperature; in fact, the flavor only improves.) Cover the remaining syrup with plastic and store at room temperature. When ready to serve, whisk the remaining ½ cup confectioners' sugar into the remaining syrup. Set the cake on a rack over a baking sheet and pour the glaze over the cake. Let stand for at least 10 minutes before slicing and serving. Such a delicious looking cake! And I love that cake stand! Looks amazingly delicious. I tasted something similar with pineapple this weekend. I want a huge slice rite now, very pleasing and droolworthy cake. Cake looks superb and the pics are wonderful... Beautiful recipe and visuals.. Tried this one an dit turned out really well.I dont have a bundt pan, so baked in the round one - it came out nice and really soft. 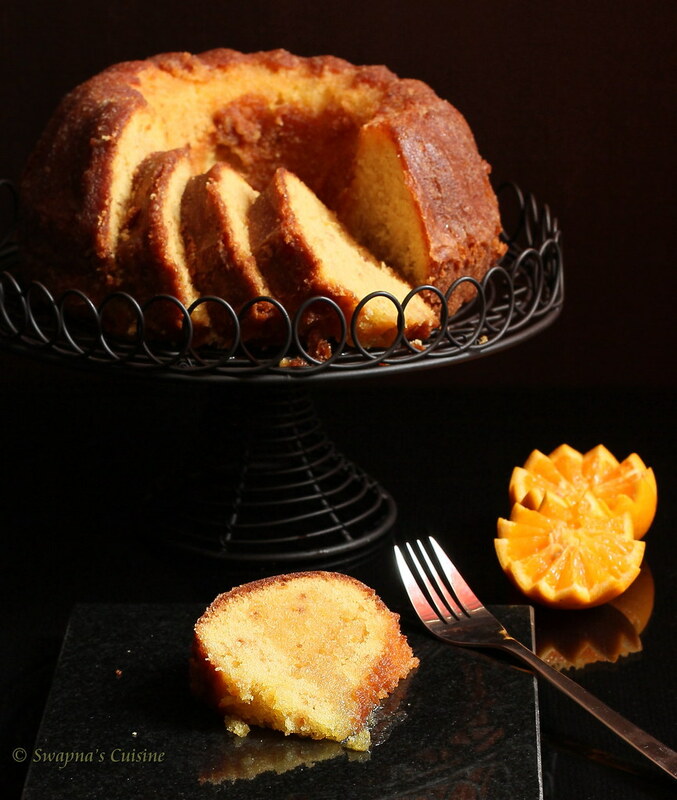 I heated up the glaze with marmalade and poured over the cake - that also turned out well. 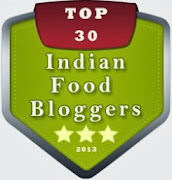 Your recipes are sure to come out well..keep blogging. 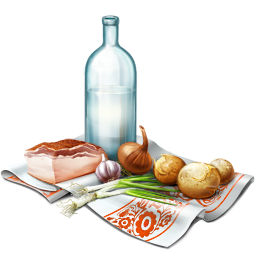 Thanks a lot for the wonderful recipes. Swapna, I tried this cake and it came out very well.I love it. i was little doubtful abt the no. of eggs since i don't like the smell of egg but it there was no bad taste of egg.it was superb. I know what Iam baking this weekend : ) I dont have a traditional bundt pan but have one that makes cake in tube shape so will make in that. chocolate and orange is a heavenly combination for me. the bitterness of orange jest adds the perfect kick to the chocolate. But this recipe seems perfect in itself. think I could add chocolate in some way? thanks for the link. The cake looks yummy.the pic are great. Can you tell me where i can find/buy (Chemist ?) cream of tartar . I have read bout it being used in baking recipes for stabilizing egg whites. 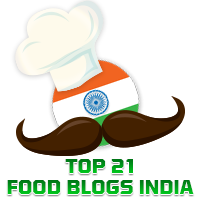 Hi Swapna, happened to come across ur blog while searching for some recipes on the net and have been glued on to it since the last 2 hours. Amazing recipes and beautiful photography and loved the presentation. Had some doubts and wanted to clarify them before I could try out the cake. Can you please give me the measurements in grams please? also the orange concentrate is made by reducing the orange juice by heating? Please do let me know so that I can try making this awesome cake. Thanks in advance. 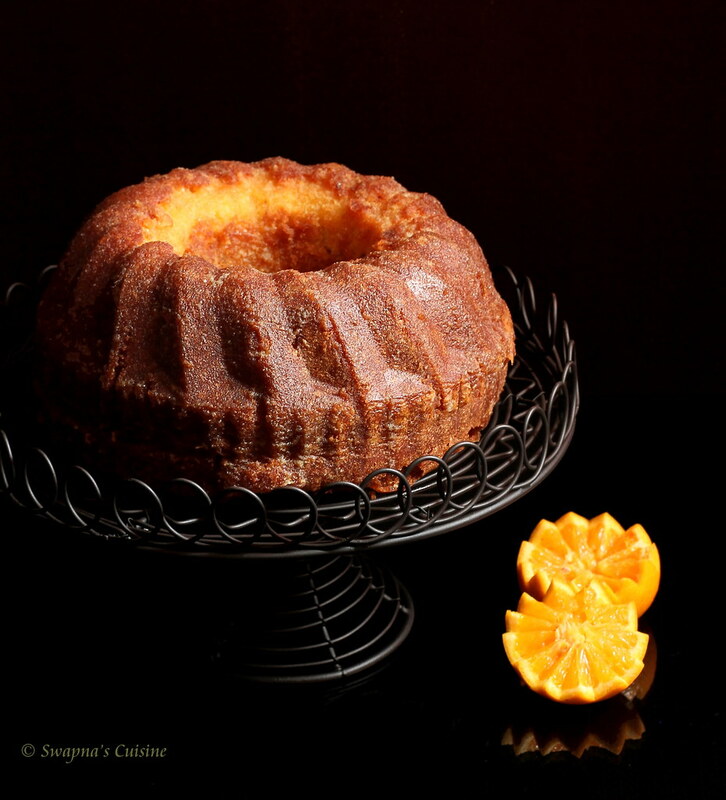 In this recipe orange concentrate means freshly squeezed orange juice without adding any water. Let me know how you like the cake.